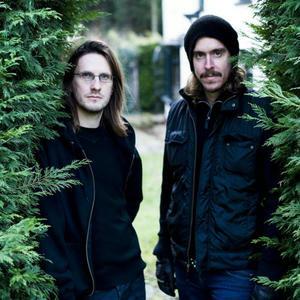 Storm Corrosion is the musical collaboration between Mikael &Aring;kerfeldt (Opeth) and Steven Wilson (Porcupine Tree). The project's self-titled first studio album (released on May 7, 2012, through Roadrunner Records) has been described by Wilson as being "the final part in the odd trilogy of records completed by [Opeth's] Heritage and Grace for Drowning". Mikael ?kerfeldt first became aware of Steven Wilson circa 1995-1996 after ?kerfeldt's best friend Jonas Renkse played him the Porcupine Tree album The Sky Moves Sideways. Mikael ?kerfeldt first became aware of Steven Wilson circa 1995-1996 after ?kerfeldt's best friend Jonas Renkse played him the Porcupine Tree album The Sky Moves Sideways. ?kerfeldt instantly fell in love with the band and began collecting their work. Years later, Wilson e-mailed ?kerfeldt after being given a copy of the Opeth album Still Life by a French journalist. The two ended up meeting for dinner in London where ?kerfeldt asked Wilson to produce the next Opeth album. It was also during this dinner that the two first talked about a possible collaboration. Wilson agreed to produce what would become Blackwater Park, Opeth's fifth album. He later returned to produce two other Opeth albums ? Deliverance and Damnation. He also mixed one Opeth album, Heritage. In 2005, ?kerfeldt contributed some guitar and vocals to Deadwing, Porcupine Tree's eighth album. Having worked with each other in the past, they decided to start work, on an on and off basis, on a collaboration in March 2010. Mike Portnoy of the band Dream Theater was initially reported to be a drummer for the material, but ?kerfeldt later revealed that he was no longer part of the project, citing that "there's just no room for drums on what we've done so far". Wilson would later clarify that only "15-20%" of the album would have drums on it, and it would be performed by Porcupine Tree drummer Gavin Harrison. The album was completed in September 2011, but held back for an April 23, 2012 release so that Wilson could concentrate on releasing and promoting his second solo album, Grace for Drowning, and ?kerfeldt could concentrate on Opeth's tenth studio album Heritage, both albums being released in September 2011 themselves. "Because I think we both had this idea of this kind of music that we knew we couldn't get our bands to play, but that we both kind of understood where we were coming from. ?Cause we have this kind of passion: very experimental, obscure records, almost orchestral in their scope. And we wanted to make a record like that for a long time. It's a long way from metal and it's a long way from anything that, I think, Mikael has ever done, including [Opeth's] Damnation record. I think a lot of people thought, ?Oh, it's gonna be like Damnation.' It's not; it's a long way from that, too. And it's actually a long way from anything I've done? The one thing we didn't wanna do is get together and do a prog-metal supergroup, which would have been so easy to do ? and kind of expected, in a way. And, you know, we might do that anyway one day. But this time around, we thought, ?Let's just do this record.' Some people will love it and some people will not, and that's OK, because, in a way, I don't think we wanted to just give what was expected, and we're certainly not doing that.? Wilson also said that on the album, ?kerfeldt did most of the guitar work, while Wilson concentrated on the keyboard parts and arranging the music. He described it as containing a lot of orchestral parts, and as "Mellow, strange, and disturbing". ?kerfeldt has confirmed that the album will contain six tracks, with each one being over ten minutes long. Wilson has stated that they have no plans for touring in support of the album, saying that it would be "tough to pull off" due to both member commitments to their other projects, and due to the music itself. He also said that they're "not looking beyond the release of the album". An official website has been set up under www.stormcorrosion.com. The band's origin is London, UK / Stockholm, Sweden.